I am so glad to have acidicice back for a guest post today. I always love what she comes up with and today is no exception. She asked me to do a guest post for her for valentines day and I asked her to return the favour. Have a look at what she came up with. What an honour to be welcomed onto Michelle’s blog again! It is always a little daunting to appear here. I hold Michelle’s work in high regard and am always nervous about not being good enough to be featured on a blog with such outstanding manis adorning all it’s pages. Michelle is gracious enough to entertain me though, so here goes! I started off with a base coat to protect my natural nails. I then painted two coats of L.A. Girl Pink Steel on all of my nails except my ring fingers. Pink Steel is a GORGEOUS metallic polish. It is extremely opaque, applies like a dream and is a stunning pink with purple tendencies. As with all metallic/shimmer polishes it is a bit tricky to clean up, but it is totally worth it! On my ring fingers I painted two coats of Sinful Colors Charmed as accent. I used Sinful Colors Queen of Beauty to make a glitter gradient on my pinky nails over the Pink Steel. The clear polish which the glitter is suspended in was quite thick and painting multiple coats was causing major buildup on my tips, so I resorted to sponging on the glitter which worked really well as the sponge sucked up the excess clear polish and just left the glitter behind. 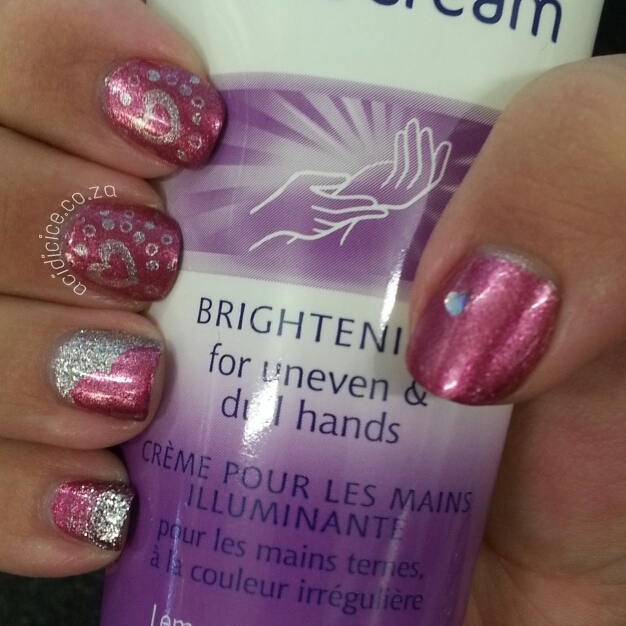 On my ring fingers I used Pink Steel and a dotting tool to outline a partial heart which I then filled in easily with the polish brush. This heart was inspired by an Instagram photo of marrynails. I used the left hand image on my PUEEN 41 stamping plate and Tip Top Armour Plate to stamp on my index and middle nails. On my thumbs I fished out a heart from Tip Top’s Valentine’s Glitter. I didn’t have any silver studs, so decided to use this holographic heart instead of a stud. I placed it at an angle instead of placing it in the centre at the cuticle. I just thought that looked cuter. I sealed everything in with Seche Vite and voila! I took quite a few photos of this mani to try and capture all the different elements. Because everything is so sparkly and shiny the camera often picked up a glare that made it hard to see everything in one shot. P.S. As you can see I used Avon Brightening Hand Cream as a prop in these photos. 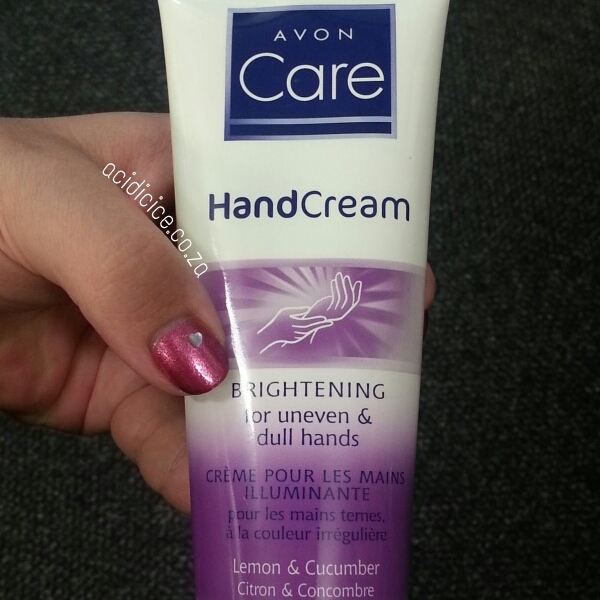 I’ve recently discovered this hand lotion and it is awesome! It absorbs like a dream and leaves your hands feeling moisturized. This one was a gift, but I will definitely purchase this again myself! Isn’t it gorgeous? I love Pink Steel and I will definitely have to pick it up. I also love the colours combined. Great job on the stamping too and that heart!! I might’ve been a little inspired 😉 Thank you so so much, I absolutely love it. What do you think? I love it – I think the pinky nail is my favourite!